Beautifully engraved specimen stock certificate from Netcentives, Inc. This historic document was printed by the Secuirty Columbian United States Banknote Company and has an ornate border around it with a vignette of the company's logo. This item has the printed signatures of the Company’s President and Chief Executive Officer, and Assistant Secretary and Chief Financial Officer. SAN FRANCISCO, Dec. 12, 2001 -- As part of their jointly administered Chapter 11 bankruptcy proceeding, Netcentives Inc., (OTC Bulletin Board: NCNT.OB) Post Communications, Inc. and MaxMiles, Inc., all of San Francisco, announced that as of December 7, 2001 all business asset sales have closed as follows: 1) On December 6, 2001, Princeton Entrepreneurial Group, LLC acquired MaxMiles, Inc. and purchased all outstanding shares of UVN Holdings, Inc.; 2) On December 7, 2001, Trilegiant Corporation acquired the Netcentives patent portfolio; 3) On December 7, 2001, North Bay Networks acquired Netcentives' Loyalty Marketing Group furniture, fixtures and equipment; 4) On December 7, 2001, Charles River Consulting, Inc. acquired Netcentives' Loyalty Marketing Group assets; 5) On December 7, 2001 CD Micro, Inc. acquired Netcentives' remaining furniture, fixtures and equipment; and 6) On December 7, 2001, YesMail, Inc. acquired Netcentives' Email Marketing Group. Netcentives has ceased all operations of its business and has begun a wind down process that should be complete by the end of March 2002. The company does not expect that the proceeds from the sales described above or from the sales of any other assets will be sufficient to fund a dividend to shareholders once creditor claims have been administered by the U.S. Bankruptcy Trustee. SAN FRANCISCO, October 9, 2001 /PRNewswire/ -- Netcentives Inc. (OTC NCNT) announced today that it has filed a voluntary petition for reorganization under Chapter 11 of the U.S. Bankruptcy Code together with its subsidiaries, Post Communications, Inc., and MaxMiles. 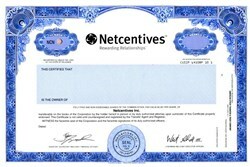 Netcentives intends to maintain operation of all existing loyalty programs and services, including its ClickRewards(R), Delta SkyMiles Shopping, and United MileagePlus Shopping rewards networks, the Email Marketing Group and other related services while it seeks to sell business assets in an auction expected to occur in November. "The filing is an important step in protecting the value of our loyalty and email business operations and the underlying intellectual property, patents and source code as we seek to sell the company's business operations," stated Eric Larsen, chief executive officer of Netcentives. "The asset auction is a continuation of a restructuring plan announced earlier this year in which we are now divesting assets and reviewing payables under the guidance of the court to prioritize liabilities and preserve cash flow for creditors and, potentially, shareholders." The Company also announced that it had signed a letter of intent to sell its Email Marketing Group, formerly Post Communications, to Plum Acquisition Corp., a company headed by Post founder Hans Peter Brondmo. The proposed transaction is subject to competitive bids and bankruptcy court approval. In a related announcement, Netcentives disclosed that it had signed a multi-million dollar patent licensing agreement with a leading Internet media company. This agreement enables the licensee to operate the online portion of its rewards programs under U.S. Patents No. 5,774,870 and No. 6,009,412. These patents demonstrate the value of the Netcentives' intellectual property with regard to the design and implementation of Internet-based rewards and recognition systems. Netcentives announced it has sufficient cash on hand to finance its operations through auction of its assets, including supporting the company's post-petition trade and employee obligations. The Company has retained the law firm of Binder & Malter to represent it in bankruptcy proceedings. San Francisco-based Netcentives Inc. is a provider of personalized email, rewards and recognition solutions. The company offers a broad suite of offline and online products including email communications, sales force incentives, loyalty and rewards solutions for retail and financial institutions. Netcentives continues to differentiate itself through its integrated marketing approach, which includes experienced client service teams, leading-edge technology and expert consulting. More than 300 companies have partnered with Netcentives to drive their revenue and reduce costs. For more information, visit www.netcentives.com. Netcentives Receives Nasdaq Delisting Determination SAN FRANCISCO, Sept. 12 -- Netcentives Inc.(TM) (Nasdaq: NCNT) today announced that it has received a letter from Nasdaq dated September 5, 2001, informing the Company of Nasdaq's determination to delist the Company from trading on the National Market based on non-compliance with the $1.00 minimum bid price requirement for continued listing set forth in Nasdaq Marketplace Rules 4310(c)(8)(B). The Company will not file for an appeal and will be delisted from the Nasdaq National Market at the opening of business on September 13, 2001. Netcentives delivers personalized email, rewards and recognition marketing technologies and programs that increase efficiency, boost productivity and drive revenue. Their solutions are designed and implemented by experts who understand the Web, the marketplace and the importance of meeting your company's specific needs. The stock was trading at $80 is December 1999 and in September 2001 it was down to $.02.